Ok, because I haven't yet found my optimal token set and don't have the starter box, I created some forged/unforged key cards to use. This prints both sides on a single 4"x6" photo sheet and comes in all three colors. Download them, print, cut and place in a sleeve. More like $20 considering the 2 sealed decks that come in the starter box you would end up buying anyway. I did, I made some yonks ago as part of a token set with some quick reference cards, chain tracker and Aember tokens .... but mine don't look anywhere near as good as those. Thanks, Gavin. I guess maybe I've learned a thing or two since using Photoshop since the floppy disk days (1991-1992). Does that comment make me look old?? Excellent work, the cards look awesome! I downloaded them right away (& also thumbed Up and left a geekgold tip , but actually didn't yet made them because I would still be missing the rest of the starter set items (æmber/damage Tokens and stun/power cards). 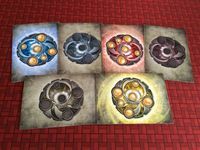 So I put my hands on and made an All-in-1 Printable set from scratch and uploaded to BGG. If at least FFG would made some sort of All-in-1 set available without the big box and unnecessary decks, eventually premium components, I would certainly buy one.